All these videos are great. There’s so much to see in them, particularly the slides with charts in them and the chatting about them. Watch the videos!! Welcome to the Google Engineering Tools blog! In the materials above, these Googlers talked about working on HEAD, and that checkins happen to HEAD at all times. Ashish says trunk a few times towards the end in a Q&A section, and he does mention an avoidance of branching for ongoing development (nothing to do with releases per se). 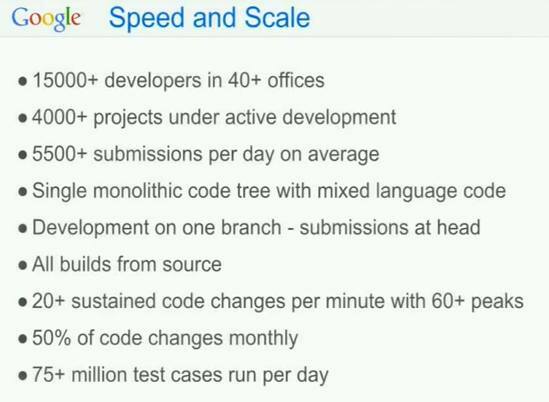 So it’s official, Trunk-Based Development (TBD) is what Google do, and boy do they scale it! Ashish talks of teams needing to depend on a common thing - Socket. Let’s call it s0ck3t so we think of it as a module rather than a concept. Two different developers in two different teams (say Gmail, and GoogleCheckout) have dissimilar technologies, but at the lower level have shared services. In our hypothetical example they both depend on s0ck3t. For their work in progress, neither developer has actually made modifications to s0ck3t. It is just in their directed graph of things they need to build and test before they can run the app (or commit the change). If one developer has build s0ck3t for the trunk at revision #12345 and the other developer minutes or hours later needs to do the same, then the supercomputer can do an optimization and give him/her build results (including object code) from the earlier build. If someone were to change s0ck3t on its own in a change-list and push that into Mondrian for review, the consequential build would pull in all that could be impacted from the entire trunk. That could be many hundred of other modules for a huge range of site/apps that could have different release schedules. It does not matter when the release would go out for those individual pieces. We want to know about the potential breakage right now. Jez Humble reminds me that CI is about earliest possible integration news, and that Trunk is the best foundation to deliver that. I can’t remember how enthusiastic notifications of breakages were, for impacted downstream modules broken in a single commit - imagine emails being sent 300 other teams: “footle tried to break Adsense with commit #13456”. Without one trunk for each module (or worse), you’d need to depend on recently binary artifacts for the same directed graph traversal, and it would be infinitely harder to guard against false-negative and false-positives. Google know exactly what they are doing with “all build from source every time, in one trunk”. I’ve blogged twice on TBD at Facebook this year. Simon Stewart (ex ThoughtWorks, ex Google) talks some more about Facebook in his presentation some hours after Ari’s one on Test Engineering at GTAC. To see his section of the first video: fast forward the slider to 7 hours, 17 minutes. Facebook have one trunk for ‘www’, one for Android and one for iOS apps (video: 8h:01m). Whereas the www trunk was Subversion (last I heard), the Android one is in Git and has a workflow that includes a ‘master’ and ‘stable’ branch. If they are sharing code between iOS, Android, and www they are implicitly doing so in a way other that a relative source directory. Directly after that Simon is asked a closing question by Noah Sussman “… so why no pre-commit hook?”, and Simon answered “because we have not had the need for it”. There’s an implicit ‘yet’ in that language, that he goes on to elaborate before closing. Smaller Agile teams too, will try TBD without too much pre-commit tooling, and use Continuous Integration & speedy rollback as the safety net, as well developer promise to do the right thing before committing.